According to the American Society on Aging, the conference will have “a strong focus on critical and emergent topics facing the field of aging, as well as cutting-edge and responsive programmatic, research, policy and advocacy efforts.” Topics will include social isolation, emergency and disaster readiness, housing and transportation access, caregiving, substance use and the opioid crisis, Alzheimer’s and other forms of dementia, technology and aging, intergenerational models, population health, and the policy and legislative issues affecting older adults. NICOA Executive Director Larry Curley will be part of several informative panels: “Best Practices for Reaching and Serving Diverse and Underserved Communities”, “Supporting Family Caregivers in Diverse Communities”, and “Native Elders: Building on Cultural and Community Strengths for Program Development and Evaluation”. Curley is a member of the Navajo Nation with over 40 years of experience working in the aging and healthcare fields. He has worked with Congress, other branches of the federal government, and national organizations on aging to develop support for programs affecting elder American Indians. Curley, along with the other members of the Elder Equity Consortium, will speak about the “Best Practices for Reaching and Serving Diverse and Underserved Communities.” Underserved, hard to reach communities need the most outreach and care. As part of the Diversity Summit “Inequality Matters: Focus on Economic and Social Inequalities and Bold Solutions in a Diverse Aging America,” panelists will speak about the unique populations they represent, the work they’re doing in their communities, discuss best practices and examples from the field. They will share the wisdom gained from working with diverse groups, as well as the tips and innovative techniques that target elders to help agencies deliver person-centered care. The Elder Equity Consortium (NAPCA, NAPPM, NCBA, NICOA, and SAGE) brings a thorough knowledge of the unique needs and concerns of each population they serve. Their diverse perspectives offer an inclusive vision of both the strengths and disparities of each community, while creating solutions and advocacy focused on elders. This interactive session will provide an opportunity to share insights and techniques about effective outreach and meaningful involvement with a person-centered approach. This symposium was inspired by the Summer 2018 issue of Generations, “Land of the Unequal? 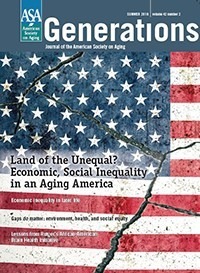 Economic, Social Inequality in an Aging America,” of which attendees will receive a copy. According to the American Society on Aging, the forum will “provide a foundation from which to understand and discuss the origins of inequities, inequalities and the intersectional nature of economic, social and physical environmental factors.” Using a lens of diversity and inclusion, “Best Practices for Reaching and Serving Diverse and Underserved Communities” will explore how race, ethnicity, gender, sexual orientation, ageism, socioeconomic and sociocultural status play out over the lifespan of diverse older adults. Attendees will learn innovative techniques they can adapt in their own service delivery and gain an understanding of how a person-centered approach can improve service delivery. The symposium will conclude with a question and answer session, which will provide attendees the chance to have a dialogue with panelists on the matters discussed. The Diversity Summit takes place April 17 from 12:30-3:30 p.m. at the Hyatt Regency New Orleans (Celestin D – Level 3). In 2014, an estimated 34 million individuals in the U.S. provided unpaid care to someone age 50 or older. And while caregiving can be an enriching experience, it can also cause health, economic and social challenges. Research has found a higher prevalence of family caregivers among diverse communities than among white or non-LGBT (lesbian, gay, bisexual, and transgender) communities, and yet few programs for diverse family caregivers exist. In communities of color, American Indian and Alaska Native communities, and LGBT communities, family caregivers face unique challenges that may not be adequately met by existing services. Issues of language access, geographic isolation, discrimination and cultural differences exacerbate the stresses that family caregivers experience. 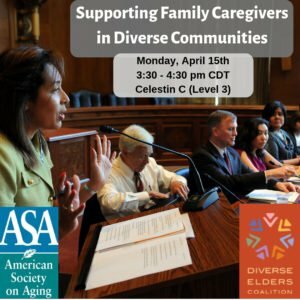 “Supporting Family Caregivers in Diverse Communities” will identify opportunities for targeted programming, share research on diverse family caregivers, offer insight into their unique needs and provide solutions. Attendees will receive practical suggestions for improving their existing health, aging, and social services programming to better meet the needs of diverse family caregivers. “Supporting Family Caregivers in Diverse Communities” is a 60-minute workshop on April 15 from 3:30-4:30 p.m. at the Hyatt Regency New Orleans (Celestin C – Level 3). As we serve an increasing number of elders from indigenous and minority groups, we need to identify, honor and build programs on cultural and community strengths. The symposium, “Native Elders: Building on Cultural and Community Strengths for Program Development and Evaluation,” will discuss community definitions of health and successful aging, including the research methods to identify them. The panel will identify innovative approaches to promote Native well-being in program development and evaluation, as well as share examples of successful programs built on cultural strengths, which aim to build resiliency. “Native Elders: Building on Cultural and Community Strengths for Program Development and Evaluation” will take place on April 17 from 3:30-5 p.m. at the Hyatt Regency New Orleans (Celestin C – Level 3). 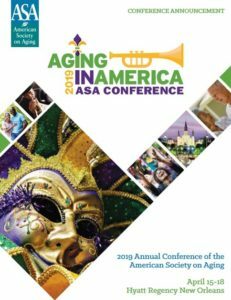 The 2019 Aging in America conference is the place to be for knowledge, inspiration and networking with people dedicated to improving the lives of elders. Don’t miss an opportunity to learn from experts and earn up to 22 Continuing Education credits at no additional cost. Pre-registration is required as some workshops and symposiums may have participant limit. Check out the schedule for a complete list of panels and workshops.